Happy people are sometimes derided as unrealistic Pollyannas, other people’s way of bringing them down to earth. I’ve heard it from people who don’t yet understand how I can be so optimistic. The dictionary defines “pollyanna” as an excessively or blindly optimistic person. 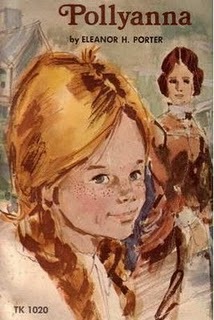 Curious about this, I requested Eleanor Porter’s book Pollyanna from the library. In the pages of this easy-to-read book, I discovered a philosophy similar to the one I live. You see, Pollyanna’s life centers on the Glad Game that she plays – the game of finding at least one thing to be glad about in any situation. An orphan taken in by her stern aunt, she inspires the town and eventually her aunt into playing this game. Invalids are comforted, quarrels are patched up, life gets better all around. When she runs into her own challenges, the whole town pitches in to help her play the toughest Glad Game she’s ever faced. The game I play isn’t quite the Glad Game, though. I don’t stop at being glad. I guess I play the Learn-Share-Do Game. What can I learn from this situation? How can I share what I’m learning? How will I respond – what will I do about this situation? This turns every joy and success into something greater, and every heartache into part of the story. There is no shame in being a Pollyanna, on facing life with conscious optimism and deliberate gratitude. Optimism can be firmly rooted in reality, finding nutrients in its depths, using the rocks of life as anchors. I play the Learn-Share-Do game. What game do you play with life? 2008: Sowing seeds: What is technology evangelism, anyway?